Buck Williams is perhaps the greatest Nets player not named Jason Kidd, Julius Erving or Drazen Petrovic, but doesn’t nearly have the legacy to show for it. That is perhaps because he was far from the flashiest player on the court, but he was still a very effective multi-dimensional big man. In his first seven years with the Nets, Williams averaged a double-double of at least 15 PPG and 11.9 RPG. His final year with the club in 1988-89, his production tapered to 13.0 PPG and 9.4 RPG. Throughout his eight years in New Jersey, he made the All-Star team three times in 1982, 1983 and 1986. He was also named to the 1981-82 All-Rookie First Team, 1982-83 All-NBA Second Team and 1987-88 All-Defensive Second Team. 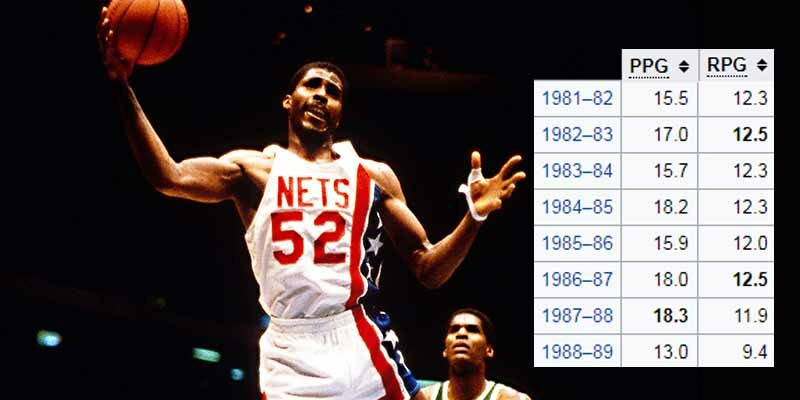 The Nets made the playoffs in each of his first five seasons, advancing out of the first round only once in 1983-84.In the playoffs that year, Williams averaged 15.5 points, 14.1 boards and 1.5 blocks per game.